The beer started with a grist of Vienna and Pilsner malts, with Oats and Wheat added, and hopped with primarily Tettnang in the kettle. Brewed in Summer 2017, it was fermented in a puncheon (700 litres) that had recently been emptied of Pineau de Charentes, a french appertif/vin de liquor. The wort was fortified with honey as it was transferred, and the Stilly House Blend™ was pitched, giving rise to a light, dry, and tart final beer. After 10+ months in the first-use-post-spirit wood, it has picked up some serious wine and spirit notes, as well as light notes of honey, rounding out the full drinking experience. Since fermentation completed this spring, it has been bottle conditioning for six months, and is ready to enjoy now. 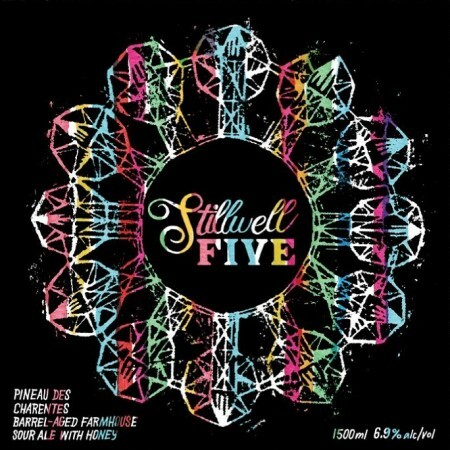 Stillwell Five will be released tomorrow (Saturday November 17th), with a limited run of 500 ml bottles available to purchase from 12:00 noon to 4:00 PM at the Stillwell Brewing facility in the rear of Propeller Brewing on Gottingen Street. It will also be on tap at the official 5th anniversary party taking place at Stillwell starting at 12:00 noon, where it will be featured alongside a special line-up of premium beers and ciders from Nova Scotia and around the world. All who attend can enter a draw for an opportunity to buy one of a handful of 1.5 L magnums of Stillwell Five that have been produced. For more details, see the event announcement on Instagram.